The arterioles (small arteries) leading to an organ, constrict in order to decrease flow to the organ. To shut down an organ, blood flow is reduced naturally to 1.00% of its original value. By what factor did the radii of the arterioles constrict? Penguins do this when they stand on ice to reduce the blood flow to their feet. This is College Physics Answers with Shaun Dychko. So clever penguins constrict their blood vessels leading to their feet in order to reduce the blood flow to the feet and reduce heat loss. So, we're told that they're going to have a reduction in flow rate to one percent of what it was before. So after constricting their blood vessels, the volume flow rate Q two will be 0.01 times the original volume flow rate Q one. Now Q two over Q one is going to be the change in pressure times pi, times the radius in the second case to the power of four, divided by eight times viscosity times length of their blood vessel. We're going to divide Q two by Q one and I'm going to multiply by the reciprocal of Q one. So times by eight n l over delta p pi r one to the power of four. 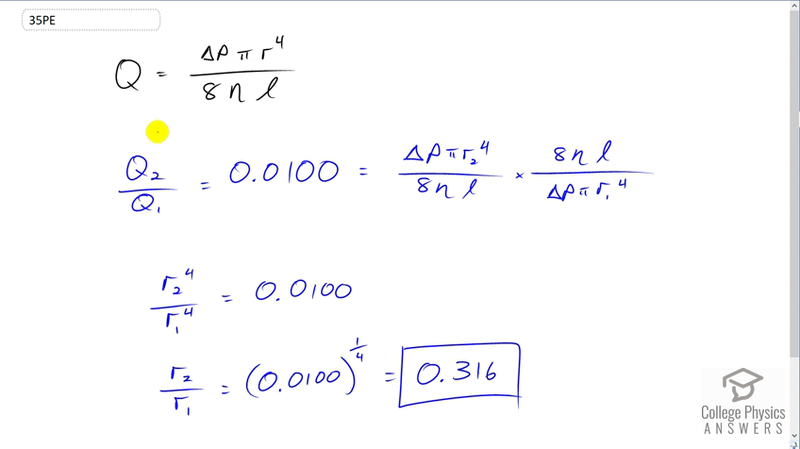 The only factor that require a subscript are the factors that change between the two scenarios. The only thing that's changing is the radius of the blood vessel and so only the radii need subscripts. Everything else cancels. So, we're left with r two to the four over r one to the four is Q two over Q one. Q two over Q one is 0.01. So that means r two to the four over r one to the four equals 0.01 and that means the ratio r two to r one which is the fourth root of both sides here, or you could say exponent one quarter, is going to be 0.01 to the power of one quarter. So r two over r one is 0.316. So r two changes by a factor of 0.316 compared to radius one.